This talk was presented at Heroku's Waza conference in January 2012. That's where concurrency comes in. Concurrency is cool! Yay parallelism!! When Go was announced, many were confused by the distinction. "I ran the prime sieve with 4 processors and it got slower!" Programming as the composition of independently executing processes. Concurrent: Mouse, keyboard, display, and disk drivers. Communication is the means to coordinate the independent executions. This is too abstract. Let's get concrete. Move a pile of obsolete language manuals to the incinerator. With only one gopher this will take too long. More gophers are not enough; they need more carts. This will go faster, but there will be bottlenecks at the pile and incinerator. Also need to synchronize the gophers. A message (that is, a communication between the gophers) will do. Remove the bottleneck; make them really independent. This will consume input twice as fast. The concurrent composition of two gopher procedures. This design is not automatically parallel! What if only one gopher is moving at a time? Then it's still concurrent (that's in the design), just not parallel. Moreover the concurrent composition suggests other models. Three gophers in action, but with likely delays. 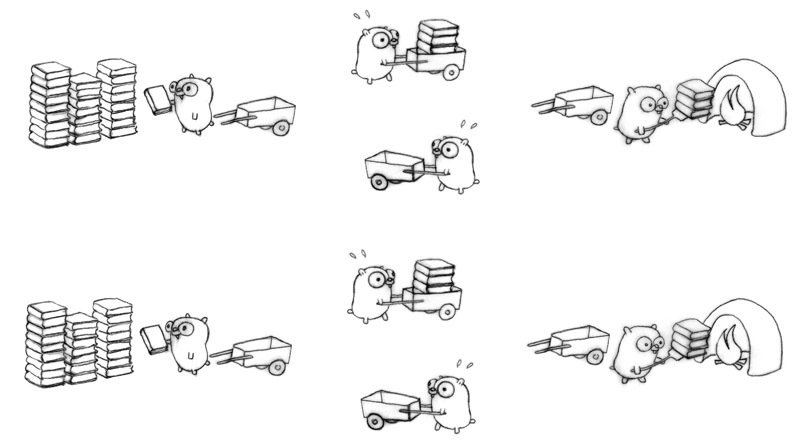 Add another gopher procedure to return the empty carts. Four gophers in action for better flow, each doing one simple task. If we arrange everything right (implausible but not impossible), that's four times faster than our original one-gopher design. We improved performance by adding a concurrent procedure to the existing design. More gophers doing more work; it runs better. This is a deeper insight than mere parallelism. Different concurrent designs enable different ways to parallelize. We can now parallelize on the other axis; the concurrent design makes it easy. Eight gophers, all busy. 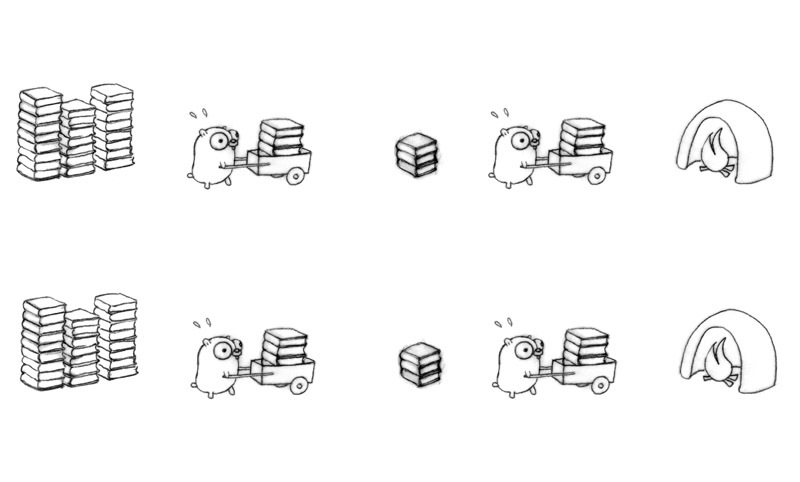 Keep in mind, even if only one gopher is active at a time (zero parallelism), it's still a correct and concurrent solution. Here's another way to structure the problem as the concurrent composition of gopher procedures. Two gopher procedures, plus a staging pile. Run more concurrent procedures to get more throughput. Use all our techniques. Sixteen gophers hard at work! There are many ways to break the processing down. Once we have the breakdown, parallelization can fall out and correctness is easy. It becomes a concurrent design for a scalable web service. Not the place for a tutorial, just quick highlights. Like launching a function with shell's & notation. Goroutines are multiplexed onto OS threads as required. When a goroutine blocks, that thread blocks but no other goroutine blocks. // Do something else; when ready, receive. // Receive will block until timerChan delivers. // Value sent is other goroutine's completion time. The select statement is like a switch, but the decision is based on ability to communicate rather than equal values. It's routine to create thousands of goroutines in one program. Stacks start small, but grow and shrink as required. Make some concurrent calculations easier to express. They are just local functions. Learn concurrent Go by osmosis. Use a closure to wrap a background operation. The for range operation runs until channel is drained. Must make sure other workers can run when one blocks. Easy problem but also hard to solve concisely without concurrency. The load balancer is implicitly parallel and scalable. The tools of concurrency make it almost trivial to build a safe, working, scalable, parallel design. The structure of the program is implicitly synchronized. Let's do a more realistic load balancer. fn func() int  // The operation to perform. c  chan int    // The channel to return the result. Note the return channel inside the request. An artificial but illustrative simulation of a requester, a load generator. // Kill some time (fake load). A channel of requests, plus some load tracking data. The channel of requests (w.requests) delivers requests to each worker. The balancer tracks the number of pending requests as a measure of load. Each response goes directly to its requester. Could run the loop body as a goroutine for parallelism. 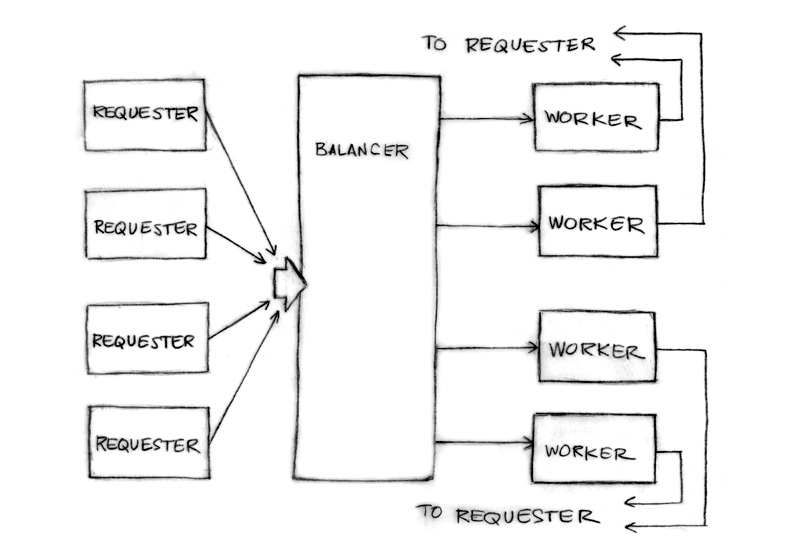 The load balancer needs a pool of workers and a single channel to which requesters can report task completion. Just need to implement dispatch and completed. Now we balance by making the Pool a heap tracked by load. // ...send it the task. // One more in its work queue. // Put it into its place on the heap. // One fewer in the queue. // Remove it from heap. A complex problem can be broken down into easy-to-understand components. The pieces can be composed concurrently. The result is easy to understand, efficient, scalable, and correct. We have a replicated database and want to minimize latency by asking them all and returning the first response to arrive. Concurrent tools and garbage collection make this an easy solution to a subtle problem. Concurrency makes parallelism (and scaling and everything else) easy.